Just wanted to share a simple St. Patrick's Day craft that the girls and I did. Begin boiling your water. 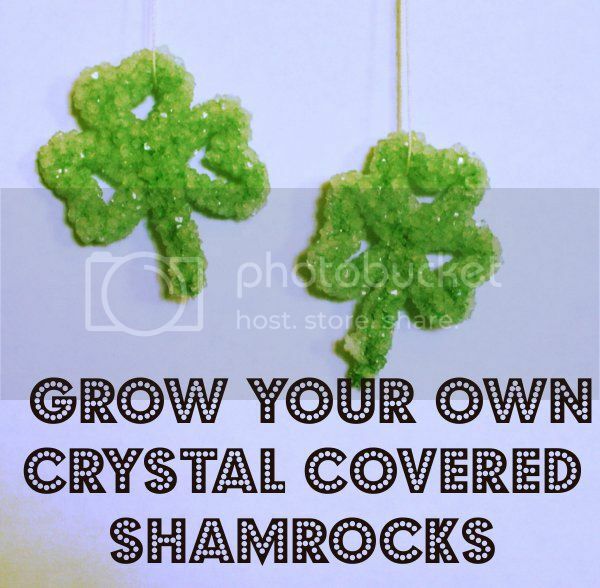 While you are waiting for your water to boil, bend your pipe cleaners into shamrock shapes. Tie a string to the top of the shamrock and tie a pencil to the other end of the string. Your sting will need to be long enough to hang the shamrock in the glass but not so long that it touches the bottom. Pour boiling water into your jars and add 1/4 cup of borax to each jar. Stir until all of the borax has dissolved. Place your shamrocks into the solution resting the pencil on top of the jar. Your shamrocks should be completely submerged. If they are not then just add more water until they are. Now is all you have to do is wait. I think it took about 3 hours before we started seeing any changes. After about 12 hours I took the shamrocks out and placed them on a paper towel and left them overnight to dry.